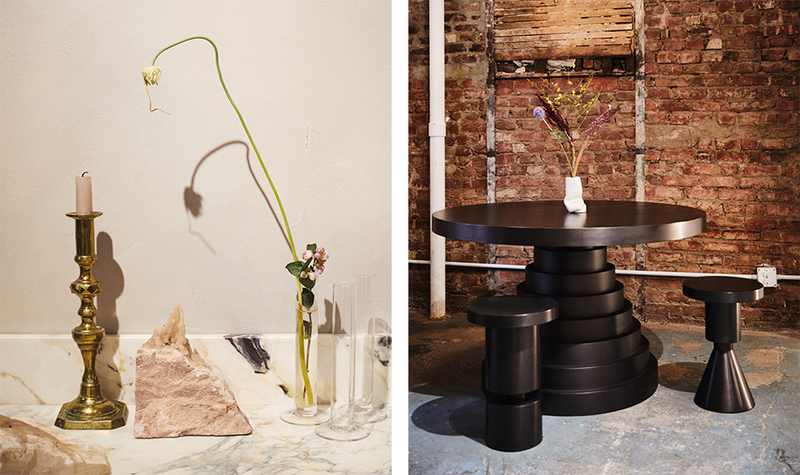 In a former burned-out print shop in New York’s Chinatown, multidisciplinary designer Anna Karlin has created not only an atelier and showroom, but a calm and curated escape from the city’s perpetual grind and, furthermore, a place of exchange where she can host dinners, parties, and events for the creative community of downtown New York. Where most would have quickly dismissed the space due to the sheer amount of restoration effort required to restore it, Anna saw a multisensory experience waiting to happen. For her, the burned-out shell presented the perfect opportunity to design a world from scratch where every component could be crafted and considered from the fit out right down to the interior scent while at the same time paying homage to what once was. 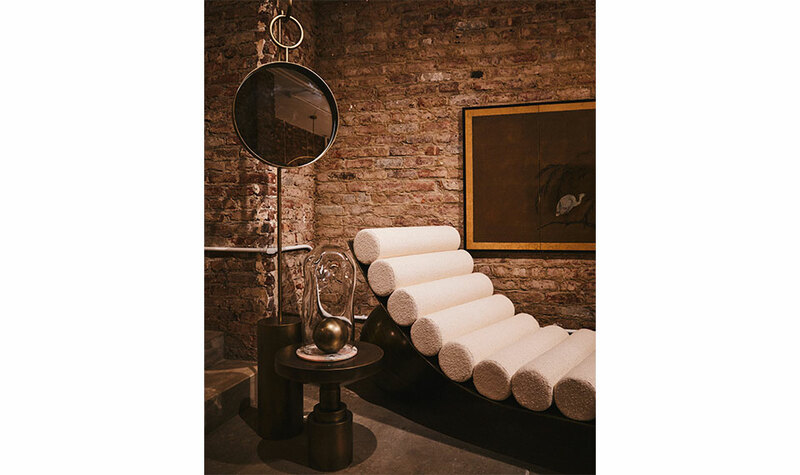 It is this foresight and can-do attitude that has propelled the dynamic creator forward in life and work and seen her practice evolve and expand from graphics and set design into highly sought-after furniture, lighting, and fine jewelry. We recently dropped by the showroom to have a look around and to get the lowdown from Anna on the six-month gut renovation, the benefit of being self-taught, and her favorite downtown spots. What was it about this space in its original form as well as the location that appealed to you? Anna Karlin: This area feels like home because we’ve been in the neighborhood for so long. My old studio is literally around the corner. We’d been looking for a space for ages and as soon as I walked in here I was like, Oh my god I really want this. I know within two seconds whether a place has the right atmosphere, and it just had good juju. It was literally just a burned-out shell of a print shop. We did six months of full construction—new ceilings, new electrics, new plumbing, bathroom, kitchen, restored the shopfront….I got the photos from government records showing what the building looked like in… I think it was 1940, and then in the ’80s. For tax purposes, they photographed all the buildings so you can go to the records and see what they looked like. It’s not the exact same moldings but they’re period appropriate. You’re often hosting dinners and events here; why is hosting important to you? AK: I love, love, love hosting, and because this is New York, you don’t get to do it in your house unless you live in a… I don’t know where you live, but not the house I live in. And so I was like, If I’m going to do this, and I’m here all the time anyway, and we have all this space, why would I not take the opportunity to make it usable in this way. So, we’ve got the full kitchen, we’ve got the service fridge downstairs, The Flower Shop lets us use their industrial cleaners for the plates and stuff. We’ve really found our groove now with how it all happens. Can you tell us about one of the most memorable events that has taken place so far and what made it special? AK: I had a really good dinner for friends. There were about 20 of us and it was just so much fun because you’re literally in a bubble—a private, little bubble. And it’s quite nice in some ways that it isn’t the domestic sphere because it’s fun going to someone’s studio and having a poke about. And there’s plenty of room to just do whatever we want. 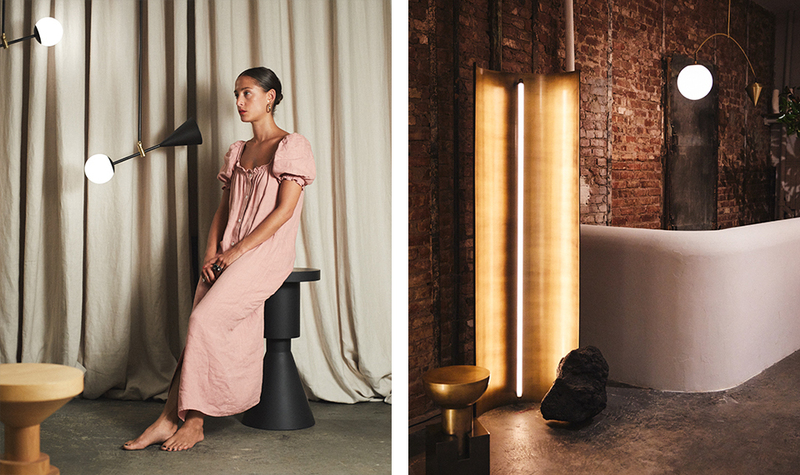 Do you see your work—from your furniture and fine objects to your fine jewelry and other projects—as exclusive entities or as a continuing series? AK: I think they’re becoming closer and closer as my language becomes more and more focused in terms of my practice. I was always totally fine with the mix of it, and I think some people do find it challenging in that they don’t know how to package you, and I’m totally fine with that. I think things have changed—being multidisciplinary now is really, really common but even, say, eight years ago it wasn’t such a thing. How important is evolution and experimentation in your creative practice? AK: It’s everything. I have zero idea how I’m going to make each new thing that I design, but I know I’ll figure it out. Being self-taught is actually a really good thing because I’m never like, oh that’s not going to work or that’s too difficult or that’s a bad idea because technically, this is all massively bad idea. If you think about it, no one is asking you to do this, you’ve just got to really, really, really want to do it and not stop because things aren’t easy. None of this is easy and none of it is neatly packaged and none of it is predictable. I think that when things are unpredictable, you need to put an immense amount of effort into research and development and experimentation because no one has done it before. So you can’t just look up online, “How do I 3D print a lava light and then stick six feet of steal onto it.” That doesn’t exist, so the willingness to experiment is huge, and I’m willing to spend a lot of time doing that in order to get to the place that I want to be and to find out stuff along the way because the process itself can often really inform the work. Are there particular themes or references that you regularly look to? AK: It’s really unfolding for me. I think it’s this tension between the natural and the manmade. A very sculptural vein runs through all the work. AK: Honestly, just take a walk and open your eyes in the most conscious sense. People often ask where I find my inspiration, and it may sound cheesy but I genuinely think, everywhere. One thing that I’m really grateful for is that for whatever reason, I’ve tapped into what makes me tick. And we all absolutely have that ability, it’s just whether we’ve worked to unlock it in ourselves or are lucky enough for it to have been unlocked. It’s like having your nerve endings opened, you’re just really receptive. AK: Lovely Day; it’s a great neighborhood spot. AK: Lucien is a good little spot. But honestly, my preference is to go to someone’s house for a dinner party that gets a little wild. AK: Oroboro; I spend far too much money there. And Ulla Johnson on Bleeker Street. To go for an after-work drink? AK: The Flower Shop and Forgetmenot. And I like the bar at Il Buco for a Sunday night martini.